‘Tis the season for getting a deal! Sure seems like Christmas is coming earlier every year, but this weekend stores are already trying to lure you indoors with deals on toys and everything else. Well, bundle up as you wait to bust down their doors because Saturday morning temperatures will be in the upper 30’s to low 40’s. And, the wind will be gusty! A front is expected to push into north Texas Friday afternoon and bring us wind and cold air. Saturday morning—low 40’s/upper 30’s with gusty Northwest winds. Sunday morning –mid 30’s in the metroplex to below freezing temperatures elsewhere. A freeze expected in Denton and McKinney. I had my doubts that I could do it. 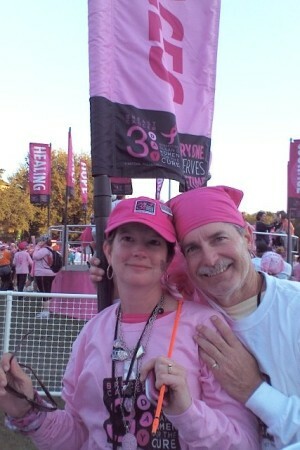 But last weekend, I participated in an amazing event: The Dallas-Fort Worth Breast Cancer 3-Day. Over three days, some 4000 north Texans took part, raising an incredible $7.9 million to help fund research to defeat breast cancer. 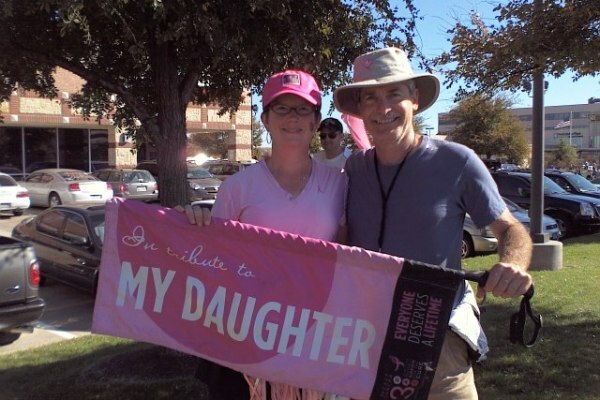 As you have probably read in previous blogs, my daughter Jennifer was diagnosed with breast cancer one year ago, at the age of 34. It was a real shock to her and to our entire family. But she has shown amazing grit and determination to defeat this disease. And she has had an incredible support group of friends – the young women who became the Cancer Fairies. While she was recuperating from surgery and chemotherapy, her friends would bring her gifts to cheer her up, provide meals for her family, help watch her children, and run errands for her. Each time one of them popped in to surprise her, Jennifer would exclaim, “The Cancer Fairy is here”. Thus the name. 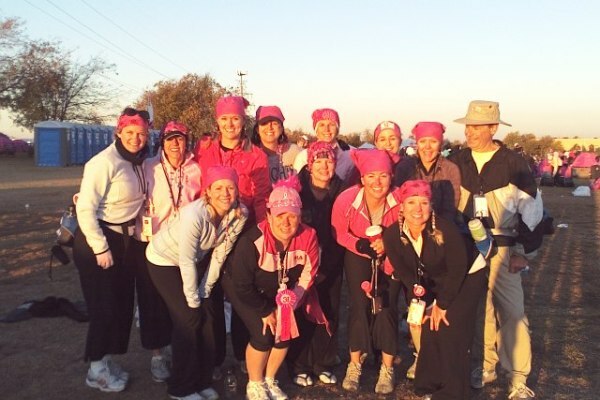 They decided to support her further by accompying her on a daunting 60 mile walk to raise funds for the Susan G. Komen Foundation. When I found out, I asked if I could accompany them. And they graciously agreed. Last Friday, we gathered for the Opening Ceremony at Southfork Ranch. It was a chilly morning, and we were all smiles. Those smiles turned to determination as we walked 20 miles to our campsite at Timberglen Park in far north Dallas. 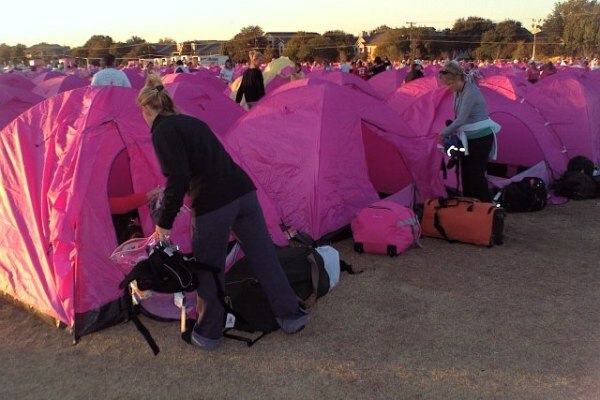 It was an incredible sight to see the park covered by rows and rows of pink tents. There were over 3000 of us camping there that night. After a hot shower, a hot meal, and a good night’s sleep, we took off again the next morning. The walkers took turns carrying some of the various banners through the streets of Dallas, Carrollton, and Plano. At one point I was fortunate enough to get my hands on the one banner that honored my daughter. Here I am with Jennifer. After we put another 20 miles behind us, we camped again at the same campsite. Then on Sunday morning, we took off for our final stretch, marching through Addison and Dallas on our way to the SMU campus. Here’s what I looked like when I arrived with my daughter at the end of 60 miles (and three days without shaving). The pink do-rag is definitely a new look for me! The Closing Ceremony there was emotional and inspirational. One out of 8 women is affected by breast cancer at some point in her life. 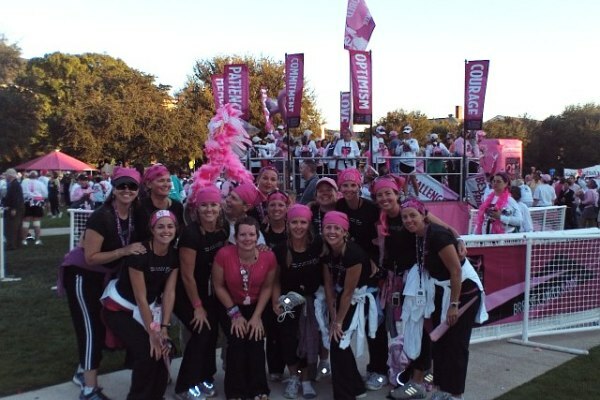 Out team of 14 in the Cancer Fairies had managed to raise almost $45,000. With the thousands of others accompanying us, the nearly $8 million raised will go a long way to ensure that my granddaughters hopefully won’t have to deal with breast cancer as their mother did. I was proud to spend those three days with 13 young women, who are even more beautiful inside than they are on the outside. (And as you can see, they are plenty attractive). By the end of the event, I felt like I had adopted a dozen new daughters. So, to Jennifer, April, Lauren, Susan, Paige, Kelly, Laurie, Shauna, Angela, Salina, Vicki, Jenny and Stephanie: thanks for sharing a wonderful 3-Day weekend. We are already talking about the possibility of doing this again next year. The most unstable air continues to stay W and SW of the metroplex. Severe storms have developed and large hail fell in Northern Hood and Northern Erath county. A tornado warning was even issued for N Hood and S Parker County. As these storms have moved east, they’ve weakened as they’ve moved into more stable air. There is still a severe weather threat for the metroplex this evening, as our air gradually becomes more unstable. A tornado watch is in effect until 7pm west of the metroplex. Strong/Severe storms will stay west of Fort Worth through 5pm. This evening, the risk of strong or severe storms will shift east into the Metroplex. We’ll likely see storms with the risk of hail, high winds and possibly a tornado warning or two. Severe Weather Back in the Mix ?!?! A strong upper level low and deep moisture will mix it up over Texas tomorrow, and a few severe thunderstorms could develop. Early Monday morning, rain and thunderstorms will develop in North TX, some of these storms could become severe with dime sized hail the main threat. Later Monday afternoon, a warm front will move across North TX and be the focus for another round of severe storms. The storms Monday afternoon could be stronger and have a higher severe weather risk, including isolated tornadoes. Keep and eye on NBC5, and here at nbcdfw.com for the latest. Baylor at UT—Sunny and warm for this noon game. Temperatures should be near 80. OU at A&M—A sunny afternoon with temperatures close to 80. Texas Tech at OK State—Chilly weather for this nighttime game. First quarter temps in the mid-50’s and dropping to the low 50’s by the end of the game.